Runner-up Brock Peterson and Home Run Derby winner Matt Davidson congratulate each other. 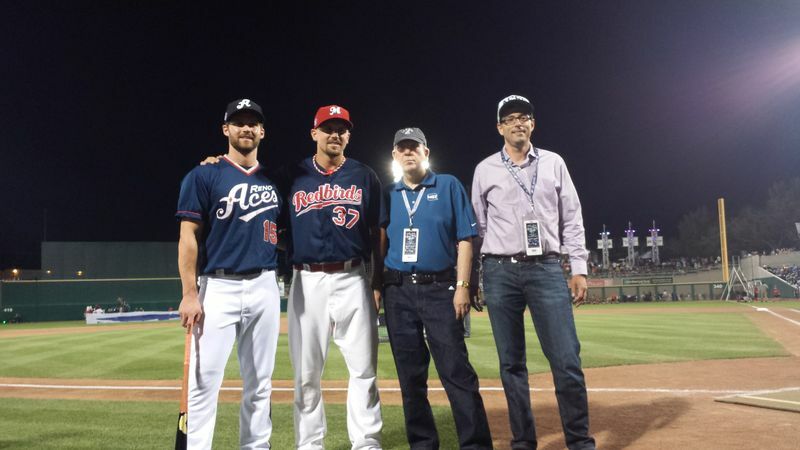 The Memphis Redbirds very own first baseman Brock Peterson was one of seven sluggers to compete in the Triple-A All Star Home Run Derby Monday night in Reno, Nev. After an exciting performance, Peterson finished in second place behind Reno Aces third baseman and MLB Futures Game MVP Matt Davidson. Peterson got off to a stellar start, producing two #birdblasts on his first two swings. He finished Round One as the front runner with seven homers, guaranteeing himself a spot opposite Davidson in the final round. 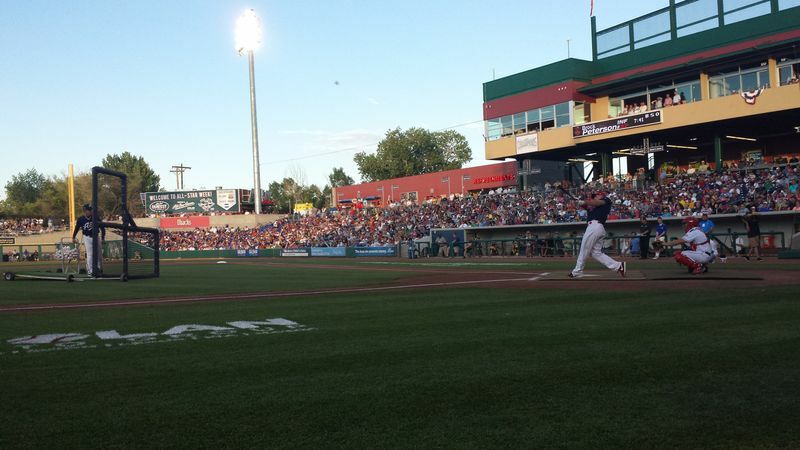 As an added bonus, Peterson was hitting off of Reno Aces Manager and former NL All Star Brett Butler. Brock elected to participate in the second round anyway, crushing two to bring his total to nine. In the final round, the scores were reset to zero. Brock started off slow but finished solid with two back-to-back home runs with nine outs. Davidson topped Peterson with four homers, reaching ten over all three rounds. Ultimately, Davidson edged Peterson out 4-2 for the win in round three despite Brock’s overall 11 homers over Davidson’s ten. Peterson leads the Pacific Coast League with 22 home runs and ranks second in slugging percentage (.546). Brock Peterson led all sluggers in the first round with seven home runs. 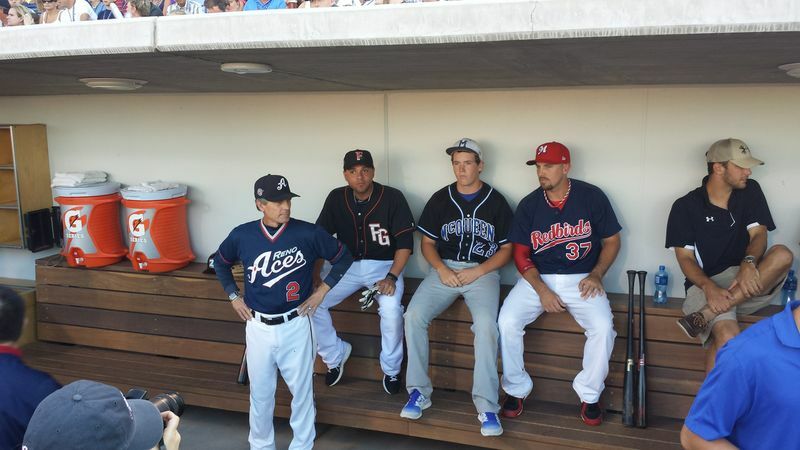 Brock watches from the dugout with Reno Manager Brett Butler, Johnny Monell and Kody Reynolds. The All Star fun is just getting started! Representing the Memphis Redbirds, Peterson and right-handed pitcher Michael Wacha were selected to join the 30-man Pacific Coast League All-Star team that takes on the International League stars in the 2013 Triple-A All-Star Game on Wednesday. This will be Peterson’s second (2004, Midwest League) and Wacha’s first professional All-Star nod, and the Memphis Redbirds Front Office couldn’t be more proud. The 2013 Triple-A All-Star game will be broadcast live on MLB Network as well as on the radio on Sports 56 WHBQ at 8:05 p.m. CDT. Winner Davidson and Runner-up Peterson receive their prizes after the Triple-A All-Star Home Run Derby.